I was initially pleased when I learned that admission fees would be waived for the 2013 edition of the Jazz Winterlude festival, but I'm beginning to have second thoughts about the matter. It's no secret that the audience for jazz is declining. Could the plethora of free concerts featuring top-tier talent be part of the problem? Jazz Winterlude's new policy will almost certainly ensure larger audiences for the annual event at Johnson County Community College. The exciting young guitarist Julian Lage and the Kansas City-based veteran vocalist Deborah Brown are two artists who stand to benefit from the additional exposure. But at what cost? It's safe to say that the only exposure many people receive to jazz performances comes during well-promoted free events such as Jazz Winterlude, Jazz in the Woods and the Prairie Village Jazz Festival. Do these otherwise excellent festivals devalue the music? Or does their accessibility translate into larger audiences for jazz performances with an admission charge? Five hundred people were willing to pay $50 apiece to hear Gary Burton and Chick Corea at the Gem Theater last night. 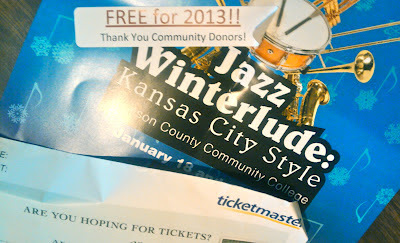 And 1,000 people shell out $40 or $50 to see each of the Kansas City Jazz Orchestra's concerts. A $7 cover charge doesn't deter a few hundred people from attending Tim Whitmer's monthly concerts at Unity on the Plaza. That's the good news. The bad news is that Folly Theater (1,050 seats) was at half capacity for a spectacular outing by Pat Metheny and his all-star band three weeks ago. I'm told that Bobby Broom recently played to a disturbingly small house at the Blue Room. The audience for last weekend's concert by Delfeayo Marsalis and Sean Jones wasn't close to capacity. And cover or no cover, an unhealthy portion of gigs by locally-based jazz artists are woefully attended. Or maybe it's just a jazz thing. Over 14,000 aficionados of country music filled the Sprint Center last night for a concert headlined by Eric Church. His fans paid nothing to see Church at Santa-Cali-Gon Days, Country in the Woods and the KC Live stage in the Power & Light district in recent years. Yet Church is capable of attracting scores of fans willing to invest a minimum of $37.50 in a ticket to see him again. I'll continue to ponder this conundrum as I enjoy tonight's free concert by '80s pop star Sheila E.
So much of it is marketing and perception. The Folly's marketing is antiquated. Even the free billboards they get don't help much. Delfeayo and Sean Jones just were not advertised well. I found out about it too late. Burton and Chick are an easy sell... even at the Gem Theater with its horrendous sound system operator. If I were a Kansas City jazz presenter I would spend a couple of days with Jon Poses (We always Swing)in Columbia. I would visit with Tim Whitmer and the KCJO on how to market things. Go to the source! Model the masters. In my opinion, a large part of the population that lives on Facebook doesn't have the dough to attend events. People with money are working one or two jobs, saving and have a time management plan in their daily lives and not killing time on Facebook. They paln things well in advance becauese their schedules are so full of commitments. The JCCC stuff is not well publicized and the Winterlude dates are the Carlsen Center "left over" dates....possibly the least desirable dates of the year. Sure there are a few ads but you need a PR MACHINE.God bless Doreen Morande at JCCC. She does good work but she is retired for goodness sake. How can you expect Doreen to be responsible for getting people in the seats....she is just one person. The Carlsen Center and Blue Room have minimal accountability because they are well funded by the government or an endowment. The KCJO, Jon Poses and Tim Whitmer have major accountability. If their programs don't draw the series' end.